Have you heard of the “prayers of the faithful?” If not, what are the prayers of the faithful? Prayers of the faithful are often prayers led by some church leader like a priest, pastor, minister, deacon, elder, or even a lay person. Some denominations have others in the congregation pray, and not just church leadership. This gives the church the idea that they too are one of many in the body of Christ, and since God has no respect for one person over another (Acts 10:34; Rom 2:11), neither should we. In our church we often call upon different people for prayer and never the same person twice. Some of the best prayers that I’ve ever heard came not from me or church leadership, but from the people in the pews. They are the body of Christ, so why not let them participate in praying for the faithful, including those in the church and those in positions of leadership? These prayers are not limited to the four walls of the church. They often (and should) extend to those in the community, in the neighborhood, to law enforcement and local and state officials, national leaders (even if we disagree with them or don’t like them), but also we should be praying for those families and friends of ours who are not saved. It is they whom Jesus will say to, “Well done, good and faithful servant. You have been faithful over a little; I will set you over much. Enter into the joy of your master” (Matt 25:21). Why did Jesus welcome this servant into the kingdom? 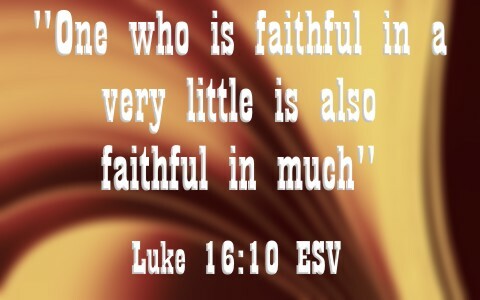 It’s because the “One who is faithful in a very little is also faithful in much” (Luke 16:10a). Those who even have a few talents given to them can at least be faithful with what little they’ve been given. To such as these, God will give “much” in the eternal kingdom where the faithful will be kings and priests (Rev 1:6), because “if we endure, we will also reign with Him” (2nd Tim 2:12), although certainly under Him. If we are saved, we already are “children, then heirs—heirs of God and fellow heirs with Christ, provided we suffer with him in order that we may also be glorified with him” (Rom 8:17). Even at the end of the age, we see the faithful with Christ, when the beast and all their wicked forces “make war on the Lamb, and the Lamb will conquer them, for he is Lord of lords and King of kings, and those with him are called and chosen and faithful” (Rev 17:14). So the faithful are those who have been redeemed and are faithful to the Lord with what they’ve been given, and faithful in doing what His body is supposed to be doing (Matt 25:34-40; James 1:27). Not only should the faithful be a praying people, they are commanded to pray. These commands to be people of prayer come in all sorts of shapes and sizes. For example, the Apostle Paul says to “pray without ceasing, give thanks in all circumstances; for this is the will of God in Christ Jesus for you” (1st Thess 5:17-18), and we are to be “praying at all times in the Spirit, with all prayer and supplication. To that end, keep alert with all perseverance, making supplication for all the saints” (Eph 6:18). Jesus told His disciples “a parable to the effect that they ought always to pray and not lose heart” (Luke 18:1), and then gives the example of the Persistent Widow who, because of her persistent petitions before a judge who refused to hear her case, still received an answer, even though he was an unrighteous judge (Luke 18:2-6). She didn’t give up, and neither should we. These are the essence of the “prayers of the faithful.” James tells us, “confess your sins to one another and pray for one another, that you may be healed. The prayer of a righteous person has great power as it is working” (James 5:16). That’s what brought so many to John the Baptist, as they came from “all the country of Judea and all Jerusalem were going out to him and were being baptized by him in the river Jordan, confessing their sins” (Mark 1:5). We’ve already read that we are to be praying without ceasing (1st Thess 5:17), but how can we possibly do that while we have to work, raise a family, go to school, or do chores around the house? Why not pray while you work, raise your family, go to school, and do the chores. That doesn’t mean we have to move to a monastery and become a monk and pray 24/7. Luther tried that and he was miserable. It wasn’t until Luther realized that he was saved by grace alone as a free gift from God (Eph 2:8-9), that his prayer life changed. It changed from a self-centered prayer life about his own sinfulness before God (although that’s good in itself), to one of thankfulness, gratitude, and indebtedness. What end is there of the many things that we should be giving God thanks for? Try writing out a list of the things that you have been blessed with, and probably like me, have taken these things for granted. We can thank Him for a warm shower, a place to sleep, food for tomorrow, a car, a job, a home, freedom, but also for our spouse, our children, our grandchildren, our church, church leadership, church members, the community, and the list goes on and on. If you have these things, then you are better off than about 83% of the world. Faithful prayers or prayers of the faithful are those prayers which are uttered publically, typically at a church service or mass, but the faithful who pray these prayers are those who have been faithful to Jesus Christ, Who is the Head of the church, and since He is the church’s Head, He expects His body to cooperate. That means we’re called to pray for one another, to love one another, and to serve one another. If we do these things, then we are faithful, even if we’re faithful in little. If Jesus sees that you’re faithful in little, He knows you’ll be faithful in much, so perhaps He will also say to you some sweet day; “Well done, good and faithful servant. You have been faithful over a little; I will set you over much. Enter into the joy of your master” (Matt 25:21).